Since classical times, the word ‘Amazonian’ has been applied to strong, self-sufficient women who eschew the company of men. Recently, a member of the British Olympic team was described as an Amazon. This is not insult. The Amazons were said to be tall, agile, strong and athletic women who inhabited their own country of Pontus near the shore of the Euxine Sea. 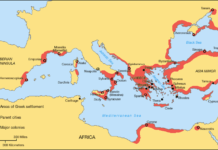 They invaded Asia Minor, Thrace, Greece, Egypt and other surrounding countries. Ephesus was one of their major cities they were said to have founded.. According to Greek legend, the Amazons were a warlike race of women who lived in the neighbourhood of the Caucasus Mountains. They were governed by a queen and once every year met the men of the Gargarean tribe in order to propagate their race. It is said that they only retained female children, the males being killed off or handed over to their fathers. The girls were trained in agriculture and combat. It was said that, when the young females reached puberty and in order to draw a bow more efficiently, their right breast was cut off. This made throwing a spear or drawing a bow so much easier and enabled speedier combat and greater freedom when fighting. The very word ‘amazon’ is created from : ‘a’ (without) and mazos’ (breast). Probably the legend is a reminiscence of the conquests of the Hittites, who descended from the Caucasian direction and overran parts of Asia Minor. It was their great nature-goddess Artemis or Diana of the Ephesians who was attended by multitudes of armed priestesses. In ancient art, the Amazons are represented in the Hittite tunic, and wielding the Hittite double headed ax. .
Strabo (born 63 BC – 23) the Greek geographer and historian was known to write about the Amazons. His great ‘Geography’ is the only extant work covering the whole range of peoples and countries known to both Greeks and Romans during the reign of Augustus (27 bc–ad 14) gives interesting quotations from technical literature concerning the Amazons. According to Herodotus the amazonian women formed a separate realm under the government of their queen, their capital being Themiscyra in Cappadocia on the banks of the River Thermodon. From there they were said to carry out warlike raids into Scythia, Thrace, the coasts of Asia Minor, and the Aegean islands, penetrating as far as Arabia, Syria, and Egypt. The Iliad describes many Greek fables such as the time they Lycia, but were defeated by Bellerophon. According to Virgil they attacked the Phrygians, who were assisted by Priam, though later they took his side against the Greeks, under the Amazon queen Penthesileia, who was killed by Achilles. 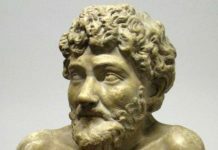 One of the labours imposed on Heracles (the Roman Hercules) was to gain possession of the girdle of the Amazonian queen, Hippolyte. Hercules’ companion, Theseus, ravished Princess Antiope, Hippolyte’s sister. The Amazons also crop up at the time of Alexander the Great, and Pompey was said to have come across them in Mithridates’ army. The deities they worshipped were Ares (whom they saw as a god of war of Thracian origin), and Artemis — not the Greek goddess but the Asiatic deity. 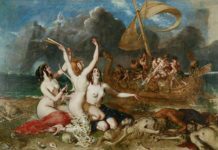 In works of art, the battles between Amazons and Greeks is represented as similar to combats between Greeks and centaurs. Their arms were the bow, spear, and axe, a crescent-shaped shield, called pelta, and (in early art) a helmet — the original model in the Greek mind apparently being the goddess Athena. In later art they approach the style of Artemis, wearing flimsy attire, hitched up for speed. On still later painted vases, their dress is distinctively Persian — close-fitting trousers and a high cap called the kidaris. The battle between Theseus and the Amazons is a favoured subject on temple friezes, vases and sarcophagus reliefs; at Athens it was represented on the shield of the statue of Athena Parthenos.